Help your child develop the skills they need to manage their big emotions and cope with life’s stresses. Do they have a hard time expressing themselves with words or have frequent meltdowns? Are their negative behaviours triggered by stress or big emotions? Emotional regulation isn’t something that just happens. ​Like tying your shoes or learning to read, it needs to be learned. Some kids watch you demonstrate how to tie a shoe once and then they’ve got it. Other kids need to be shown multiple times and many methods before they can even begin to tie their own shoes. For those kids, it takes practise, practise, practise for them to be able to do it effectively and with confidence. Emotional regulation is the same way. Kids who struggle with it need to learn multiple strategies and have the opportunity to practise it regularly before they can master it. For children who have autism, FASD, early childhood trauma, Sensory Processing Disorder, anxiety, and other special needs, it is especially challenging. ​Before we began working on emotional regulation intentionally, our house was complete chaos. We went from meltdown to meltdown and walked on eggshells in between. Tensions were always high and no one knew how to manage their stress or big emotions (including me). I felt defeated and like a failure. Once we started working on emotional regulation with real concrete strategies, the meltdowns became shorter and less frequent and there began to be times of peace in our home. I want you to know the joy of your child being able to express their feelings in a healthy way. That’s why I will be teaching you real strategies for you to guide your child in this skill. You can have more peace in your home as your child discovers how to recognize and regulate their emotions. 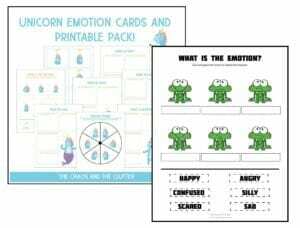 1 video specifically for kids – ​a video​​​ children can watch to learn simple calm down strategies ​​to cope with different emotions. Private Facebook group – includes exclusive content and answers to your questions, as well as access to other parents on a journey similar to yours. The group will also include some Q&A videos with me so you can get the most out of the program. ​​That’s $400…and you get it for only $97! I’m so impressed with this program! As a mom of children adopted from foster care with serious behavior issues, I’m all too familiar with a child who rages out of control and is even out-and-out violent. These strategies are not a miracle cure, but they DO work. I love that there’s even a video for the kids to watch and I was especially impressed with the handouts. I can’t wait to get to know people in the private FB group because sometimes this road of parenting feels lonely. But we are not alone. Thanks Sharla for your program.